Student loan debt is one of the major home-buying challenges for the millennial generation. According to a survey by the National Association of REALTORS® (NAR), 83 percent of surveyed millennials said they are delaying their home-buying plans by a median of seven years in direct correlation to their student loan debt. In today’s financial landscape—even with options such as loan consolidation, repayment restructuring and earnings-based, graduated payments—millennials are having difficulty paying bills, let alone freeing up their debt-to-income ratio and saving for a down payment. For those struggling with overbearing debt, bankruptcy can be an intimidating option that is saved as a last resort; however, since 1998, student loan borrowers were not eligible for discharged student loans through bankruptcy until 2005, when Congress added an “undue hardship” condition, according to the Wall Street Journal. Even so, the law does not clearly define what it considers “undue hardship,” giving banks—which rarely grant loan forgiveness—the deciding power. On Wednesday, the Education Department announced it is looking to clarify what constitutes “undue hardship” to give student loan debtors a better chance at having their loans expunged, and opportunities for more borrowers to apply for bankruptcy if needed. “The U.S. Department of Education seeks to ensure that the congressional mandate to except student loans from bankruptcy discharge except in cases of undue hardship is appropriately implemented while also ensuring that borrowers for whom repayment of their student loans would be an undue hardship are not inadvertently discouraged from filing an adversary proceeding in their bankruptcy case,” according to an Office of Postsecondary Education, U.S. Department of Education statement. Chapter 7 – Liquidates assets to pay as much of the debt as possible—a blank slate in the financial world. Chapters 11 and 13 – Restructures the debt and sets up a repayment plan approved by the court. Chapter 11 has no limit on the amount of money owed, while Chapter 13 filers must have a steady income less than $394,725 in unsecured debt and less than $1,184,200 in secured debt, according to Debt.org. According to realtor.com®, most individuals who file for bankruptcy will have to wait at least two years before they are considered for a home loan; and lenders are more lenient with Chapter 11 and 13 bankruptcy filers. It is also highly dependent upon each individual’s personal experience and the type of loan being applied for—some may have to wait up to four years. Credit also needs to be taken into consideration, as it can depend on how quickly an individual repairs their credit score; however, certain loan programs that can help millennial buyers purchase with low down payments and low credit scores, such as FHA and VA loans, may be less stringent with their bankruptcy restrictions. 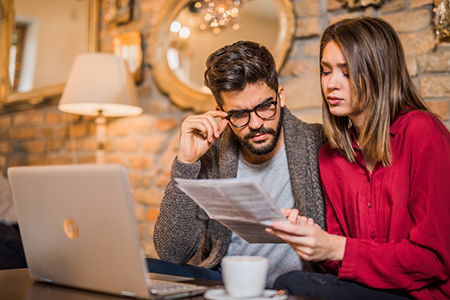 As student loan debt is a widespread home-buying obstacle for the millennial generation (and may be passed along to future generations, as well), it is crucial that the problem be addressed within the real estate community. Is the solution in more lending programs with lessened restrictions or increased eligibility for bankruptcy? Some sources say that increasing bankruptcy eligibility to expunge more student loan debt will only spur heightened interest rates by lenders and increased tuitions by educational institutions. If that is the case, future generations will have even more difficulty managing their student loan debt repayment and saving for a down payment. A rise in bankruptcy applicants may, however, incentivize the creation of more government-sponsored mortgage programs targeted toward those suffering from high student loan debt. The Education Department is seeking public comments on which factors should be considered “undue hardship” in bankruptcy cases dealing with student loan debt. Interested individuals must submit their responses by May 22, 2018 through the Federal eRulemaking Portal or via U.S. mail, commercial delivery or hand delivery to Jean-Didier Gaina, U.S. Department of Education, Office of Postsecondary Education, 400 Maryland Avenue SW, Washington, DC 20202-6110.